Emirates Global Aluminium (EGA), the largest industrial company in the UAE outside oil and gas, has announced that commissioning of its new Al Taweelah alumina refinery has entered its final stages. 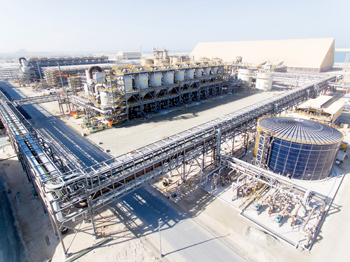 On the project progress, EGA said commissioning of the four major sections of Al Taweelah alumina refinery is being completed in a carefully planned order, with the final stages of the Bayer process ready for production first. Commissioning of the last process stage, calcination, was completed in December. The Emirati aluminium giant said the first production from Al Taweelah alumina refinery is expected during the first half of this year. EGA has now begun hot water testing of the digestion section of the alumina refinery. Digestion is the first of four successive stages of the Bayer process through which bauxite ore is refined into alumina, the feedstock for aluminium smelters. Digestion involves the heating of a slurry of crushed bauxite and caustic soda to 270 degrees centigrade using steam. “We are looking forward to beginning production and ramping up of this project, which along with our Guinea mine will transform EGA into an integrated global aluminium producer,” he stated. On the ongoing progress, Kalban said testing equipment and pipelines with hot water under high pressure simulates normal operating conditions and is the last step to ensure a facility is ready for process chemicals to be introduced. Earlier this month, EGA’s nearby Al Taweelah power plant started delivering steam to the new alumina refinery through new connecting pipelines. Supplying steam from EGA’s existing power plant, which was built to provide electricity and steam for EGA’s Al Taweelah aluminium smelter, improves the alumina refinery’s overall energy efficiency.